The author of this review is an ambassador for AKU as of May 2018. It's impressive what you get when science meets exceptional, quality materials. 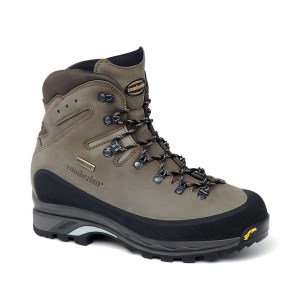 A great trekking boot fit for an adrenaline junkie. I was sent the Tengu for testing from AKU. When I first put the boot on, it literally slurped my foot into it; it makes an audible sound. 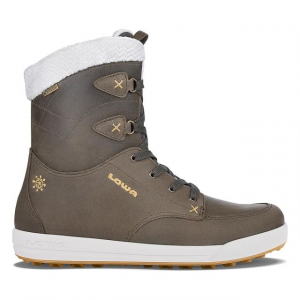 The boot has what is called a Goretex sock. 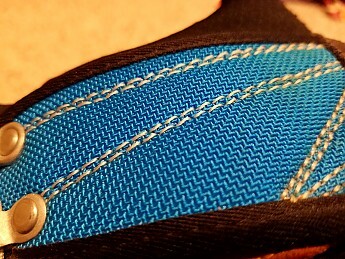 It's somewhat like a neoprenish sock that's built right into the boot. It is quite comfortable and form fitting. I wore the boots to work each day for a week thinking that I'd have to break them in before taking them on the trail. AKU prides itself on its technology that allows the user to hit the ground running with no needed break-in time. I must say, I had no hot spots or comfort issues the entire week. The one thing that I did notice is that I had to adjust from a zero drop shoe to a heeled boot (Tengu). Since I haven't worn a heel in years, this fatigued my leg muscles a bit. After about three weeks of wear, I grew accustomed to the change. 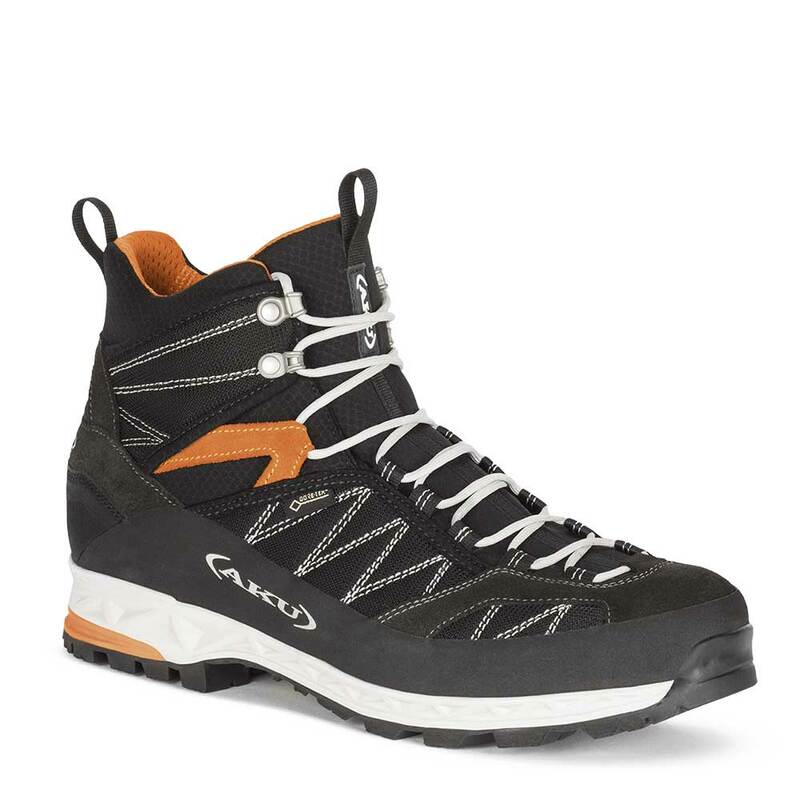 As far as weight goes, you'll find lighter boots on the market. Most lightweight boots that I've owned have had a two year life span at most. The Tengus weigh in at 510 g or about 18oz/piece. Not a tank but not that light either. This is a choice that you will have to weigh. 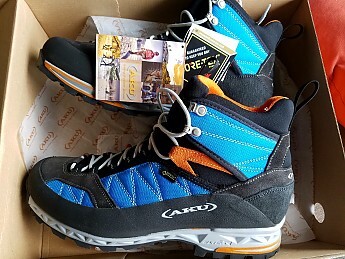 If you buy a lightweight pair of trekkers, they'll be dead in less than a thru hike. AKUs look like they're built to be around a while. This may only be speculation since I've not had them out an entire year but here are a few things that might back up what I mean. The upper material is less of a material and more of a corded weave. It's really heavy duty. 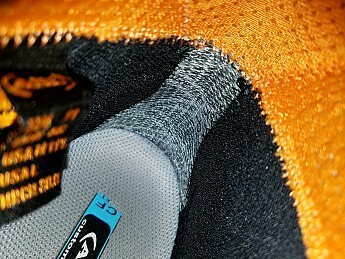 The interior of the heel is reinforced with a very tough thread to prevent wear. The toe cap is adhered to the upper very well. 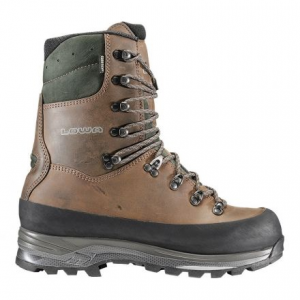 The boot has a high quality Vibram sole. Stitching is thorough. The insert is firm foam and not that squishy stuff that becomes .5 mm thick after one season. When I first started wearing the boots, I left the top eyelets unlaced. I don't like to lace up my boots all the way to the top. I feel it's somewhat like buttoning the bottom button on a suit. I learned that on the Tengus, it's better to lace all the way up. 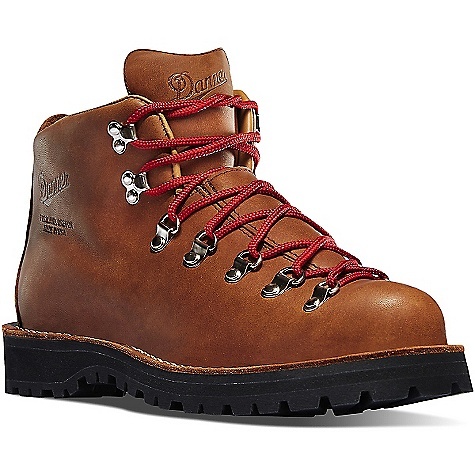 If you walk with your ankles too close together, the lace on one boot will get caught in the open eyelet of the other boot and you will go down for the count. 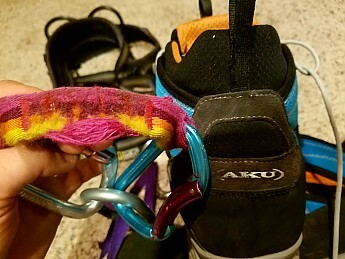 After getting tangled in my own laces twice and taking two falls, I bit the bullet and started to lace all the way up (loosely). I've had no spills since. In the near future, I'll most likely do what I've done on other boots that have given me similar issues. I'll just squeeze the eyelets shut so they can't catch on laces. You know how some laces you have to double knot or you end up dragging spaghetti all over? The AKU laces keep tied pretty well. They just don't come undone very easily. I was eager to put these boots through the wringer. Mentally, If I know that I didn't have to invest much or any money into a product, I feel like I can really give it a beating without remorse. This is how I roll with most everything; cars, clothes, outdoor gear. I gave these boots a beating on my first outing. 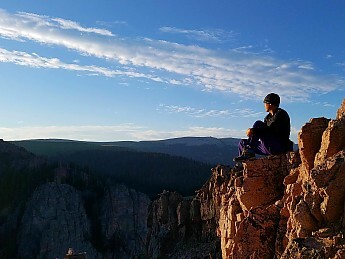 I did a whole evening of crag hopping, hiking, and spelunking at an old quarry. The boots took impact from 5-6 foot high jumps surprisingly well. They offer admirable support to the ankle but still allow it to do enough work to take burden off of the knee. The Vibram soles also grip well when wet. 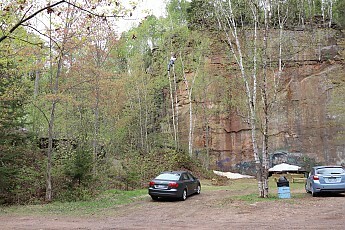 The quarry has tunnels that snake through giant rock piles. I like undulating through these tight squeezes. 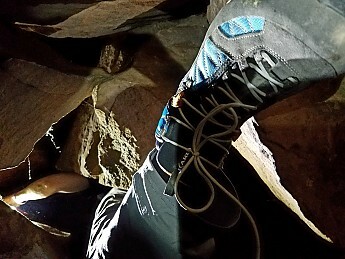 Pushing through really tight spots in sandstone has a tendency to grind your materials. The Tengu's upper incorporates cloth with leather. I was grinding them a lot. The material holds up against abrasion well. During the hike back to the tent, we were caught in a rainstorm. By the time I arrived back at the tent (which I accidentally left open! 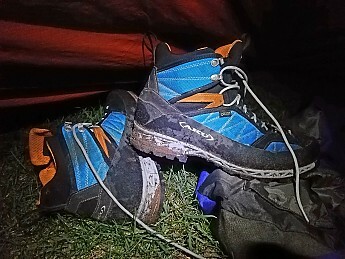 ), my shirt was soaked, my pants were soaked, my sleeping bag was soaked, but my feet were dry. The real reason I wanted to come up to the quarry to test the boots was because of an event that happened two weeks prior. I wanted to climb a 200 foot derrick cable. I was in low top shoes. 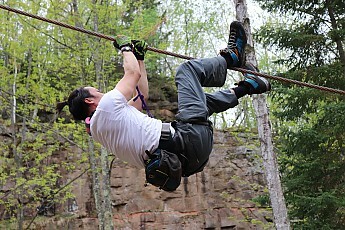 After climbing for only a few yards, the cable tore up my ankles and I had to quit short of my goal. I figured, if the AKUs could keep my ankles safe, they'd earn their stripes. I slid them along the cable for what seemed like forever- both up and down. They worked like a champ. The dog bone on my Mammut quickdraw was shredded by the end. The boots were nearly unfazed (a small section of stitching wore through; 2-3 stitches). 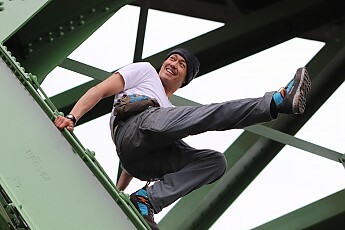 The next outing, I took the boots out to go climb a bridge. 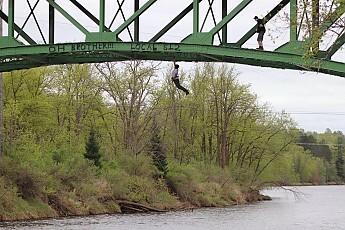 They clung to enameled metal as well as I clung to the bridge while hanging with one arm. Good grip! I'll be taking these boots out for their next assault with anticipation. I'm really enjoying them. I know sandal season is at my doorstep but geez, it's hard to keep the AKUs off the feet. I brought the boots on the trail this past weekend. The temps were 90°F and humidity was high. The boots actually did a great job keeping their breathability. 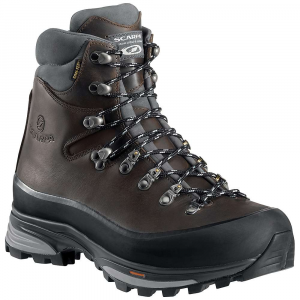 AKU attributes their breathability to the way the Goretex is adhered to the boot. In many boots they wipe on the glue and stick the Gore to it. The glue creates an impermeable layer that doesn't breath. AKU uses what they refer to as a birds nest application. Thin strands of glue that are woven to allow air flow through them. I was curious if this was just "whistlin Dixie" or if there was any merit to it. Apparently, it works. My feet were comfortable the entire trail. There are claims that the breathability of Goretex can't start working until it reaches a temperature that is unhumanly possible to acheive without dying. I've always been dubious about this claim since I've tried a lot of variants/copycats of Goretex and I always think that Goretex has a slight edge over others in this category. Along the way, I was met with portions of the trail with standing water and ankle deep mud. The boots rolled right through it. I just washed them off in the creek when I arrived back in camp. Still going strong. 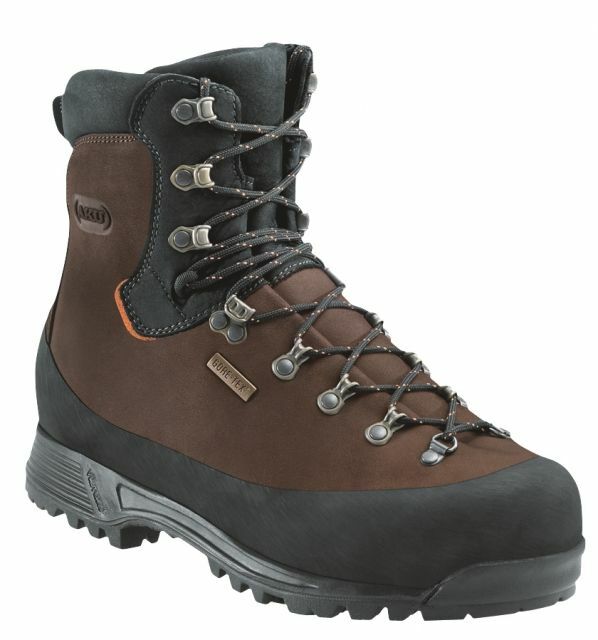 Since the original review of the boot, I squeezed the eyelets closed with a Leatherman and now the laces can't catch on them. This eliminated the problem of the laces catching on the eyelets and tripping. Maybe future designs can take this into account. 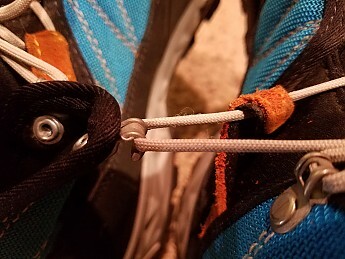 Also, after about a week, the laces lost much of their ability to grip and they started to come undone on moderate hikes. This forced me to tie a weak double lace. 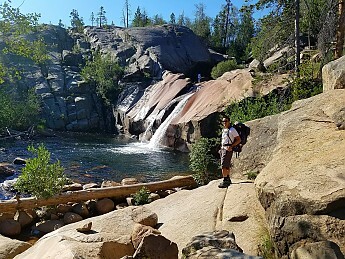 I took the boots on a five-state tour through the western United States. 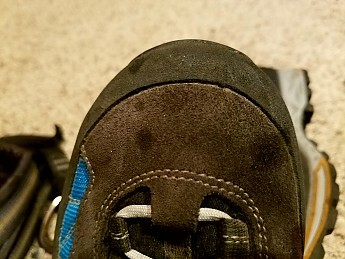 During a four-hour hike through the Wind River range in Wyoming, my feet developed hot spots when I became careless and didn't tighten the laces. The extreme ups and downs created way more friction than I was used to in Minnesota. 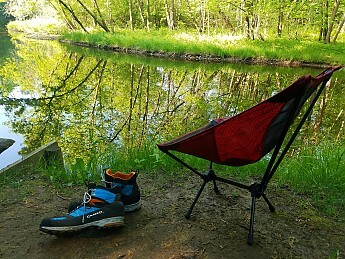 I rested my feet for a day in cold river water. 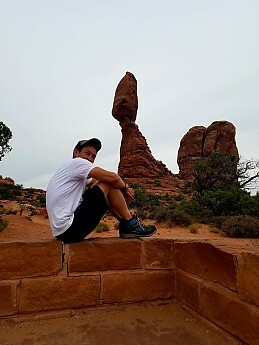 When we arrived at Moab two days later, I pulled the laces tight to eliminate sliding around in the boot. That did the trick. My comfort level went way up and I was able to trek again without the fear of blisters. Besides one of the lace ends becoming shredded, the boots are holding up well. Great review Jesse, that bridge shot is cool! Thanks Jake. Looks like you are a teacher too so you know how nice it is to have that extra time off in the summer for the outdoors. Essential. The AKU Tengu Lite GTX is not available from the stores we monitor.